Some dogs like hats. Here are some of the popular hats on the market at this time. Items on this 10 Best dog hats list include occasion hats, anytime hats, costuming type hats and others will warm the hearts of everyone that they meet. These hats are well made and can fit almost any size head. It will be a welcome addition to anyone’s hat collection. So you have a Birthday in the family? This is the hat to wear! 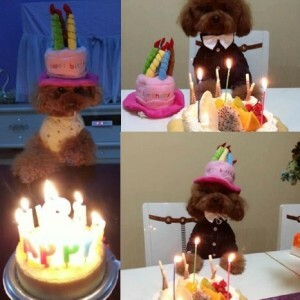 It is a plush pink cake with multicolored candles that will definitely brighten up the room. It attaches like the human version right around the neck. The vendor says that one size fits all so it will look comically small on the larger dogs and comically huge on the smaller dogs. If you are interested in having special memories with your pet – this is the hat for you. This is one of the most versatile hats I have seen on the market. It is meant to be part of a garden gnome costume. But at the same time, it could be possible for a Santa Claus costume. It has a red pointy hat and a white beard! The possibilities are endless for this hat. It is possible to dress it down and up. It is a perfect item to add to the wardrobe. With all the Elf on the Shelf activity – why can’t the dog be one of the Elf’s pranks? Spread the Christmas cheer with dressing the dog up as Santa’s helper. This unit sits on your dog’s head and wraps around the neck area to keep it securely on your dog’s head. In looking at the design, this is specifically a winter holiday hat. 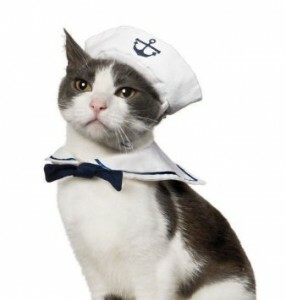 Hey Sailor! This is perfect for the family that loves the nautical theme. 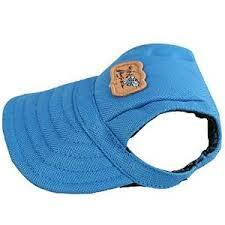 This hat includes a navy collar as well. This particular set is for a smaller size animal but there are other sizes available. The vendor just chose to use a cat to model hat. But it will work well with the dog community. Just think how impressed everyone will be during the summer months while you are walking your wonderful pup in this costume! Breakup the gloomy weather with this colorful sunflower hat. This one has petals that go all around the head and neck area. These colors are vibrant and will definitely gain other’s attention. This could possibly be used as something for your pet to be dressed up in at a harvest party or Thanksgiving. Yet again, here we have a versatile hat that will be perfect for the wonderful events that occur year round. 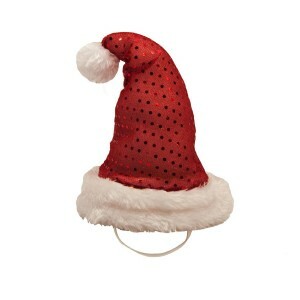 This is not your typical Santa hat. This one is decked out in sequins and lights. You will know where your dog is this holiday party simply because of this wonderful hat. This comes in multiple sizes. The best part of this is that there are no extra bells. So, you don’t have to worry about forgetting to take this hat off your pet when you are watching a movie or waking someone up. This hat attaches under the chin and is worthy of the 10 Best Dog Hats list. This hat is actually a helmet. It has skull and cross bones. It is a hard hat but it is definitely worth the money spent on it. This is a perfect item for a family that likes to have non-traditional outings or loves wearing a different vibe than the rest of us. For those of us that like the more traditional Victorian style, this is the hat for your dog. This is a top hat that has a black ribbon band and looks fantastic during the winter months. This is something that you could have your dog wear to a formal dinner, holiday party, a wedding, or president’s day. The list is actually endless. This hat comes in one size but it will fit everyone. So, enjoy the special day with this exquisite top hat. Another fairly Victorian-traditional hat. This is a plaid fabric hat that is rimmed with lace. It would remind you a pioneer bonnet. 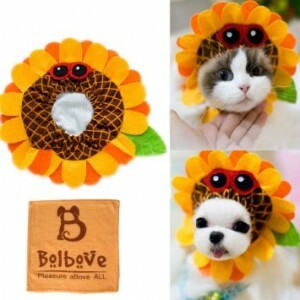 In keeping with the pioneer days, this bonnet or hat actually ties around the bottom of the chin for your pet. Don’t worry about the ears, there is space available for the ears to poke out and breathe while wearing this hat. Are you working on something in the back yard or like wearing baseball caps? Now there is a baseball cap for your dog! They come in several colors including Blue and Red. You don’t have to worry about hurting their ears. These hats come we pre-cut ear holes in it. So it will shade their eyes from the sun’s bright light. Yet at the same time their ears will be able to breathe and hear the world around them. That is why this item is on the 10 Best Dog Hats list. This list containing 10 Best Dog Hats brings together many different styles for the many different seasons of life that your family will experience with your pet. This brings together the many wonderful items of the season while bringing some non-traditional choices and some rather event flexible hats. Have a wonderful time shopping and adding to your pet’s wardrobe.